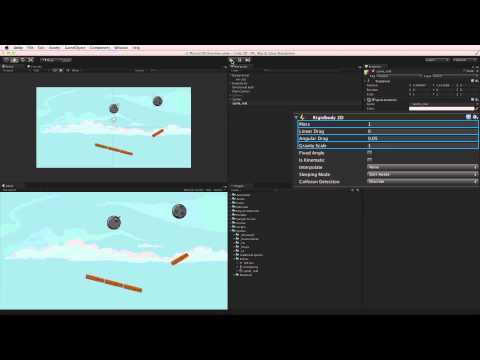 An overview of Unity's 2D Physics engine. forces in a realistic way. that handle these physical simulations. There are two separate physics engines in Unity. One for 2D physics and one for 2D physics. third dimension in 3D physics. will seem familiar to those who have used the 3D physics engine. behave in a similar way to their 3D counterparts. the descriptive part of the name. there is a rigidbody component. 2D components and scripting methods. Including box collider and box collider 2D. are comparable but not compatible. in the same scene, but they will not interact with each other. 2D physics and 3D physics. concept of depth in 2D physics. with this 2D plane at 0 along the Z axis. and can only rotate around the Z axis. Z axis position of 0. 2D physics has a number of project-wide settings. Edit - Project Settings - Physics 2D. the default material and the layer collision matrix, and more. of the 2D physics engine. and other specialised 2D physics behaviour. object the component is attached to. linear and angular drag, gravity scale and many others. physics 2D setting for Gravity. unless that rigidbody is set to ignore gravity. This is done by setting the gravity scale to 0.
game object per game object basis. it can participate in physical collisions or trigger events. physical shape, or presence, in the scene's 2D environment. that work with a rigidbody 2D. The circle, the box, the edge and the polygon collider. and can be used in different circumstances. it can use one of the several joint 2D components available. and react physically to that anchor. for more interesting and complex behaviours like chains. defined by a special type of material. This material is the physics material 2D asset. with collider 2D components attached when they collider. and physics materials please see the information linked below.